Dan, KB6NU, has some good reasons to worry about 300-3000 MHz competition for amateur bands. Right on. At least frequencies below 300 MHz are under less pressure, which is a relief to us HF & 2M troglodytes. Still, vigilance is required. Support ARRL. There is a problem with the VHF and higher bands that doesn't get a lot of attention. Amateurs are not very good at utilization. The bands are almost always completely empty, and this makes them targets for commercial use. Around here in CT, the 2M repeater segments are mostly allocated and unavailable for new applications, but they are still unused most of the time. Image via WikipediaBy contrast look at 14.070 - 14.073 kHz. I can often copy dozens of PSK31 QSOs in progress there in 3 kHz of spectrum. Also look at the cell/CDMA bands that support 100s of "QSOs" in a few MHz all the time. Hams do need to pay more attention to band occupancy. I did some more testing on U-verse vs HF QRO operation today. The main results are reported at http://aa6e.net/wiki/Uverse, which is going to be where the data from this work is accumulated. We only give the late breaking news here. As expected, winding the incoming DSL line on a ferrite core (8 turns, type 77) has helped a fair bit -- allowing a doubling of amplifier power on a good range of frequencies. 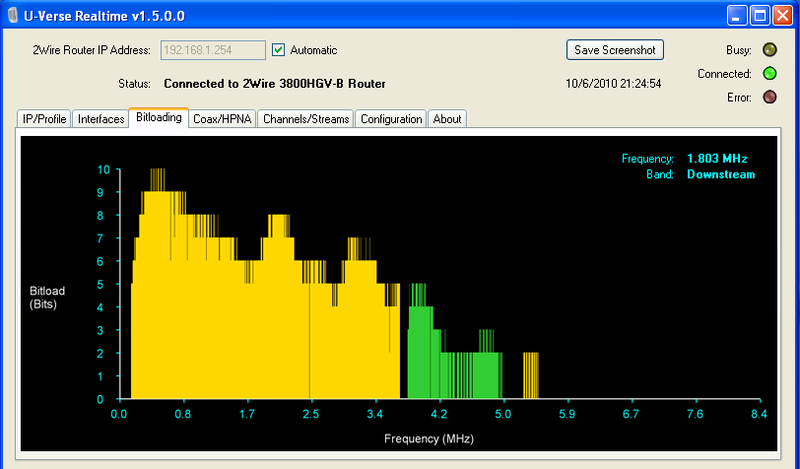 We also see that the U-verse DSL does not show any problems for QRO at 20 meters and up. 80 and 40 (and 160) are going the be the troublesome bands. But we have more countermeasures we can try. That will be for another day. I also have trouble with my carbon monoxide detector going off. (It's very loud!) And pickup in my computer loudspeakers is annoying on 40 M. All this will yield to filtering. So, we've finally got to the point of some stability with Uverse in the house for TV, Internet, and telephone service. That is, without doing much ham radio. The chart shows that frequencies between about 100 kHz and 3.7 MHz are used for download (yellow), while 3.7 - 5.0 MHz are used for upload (green). 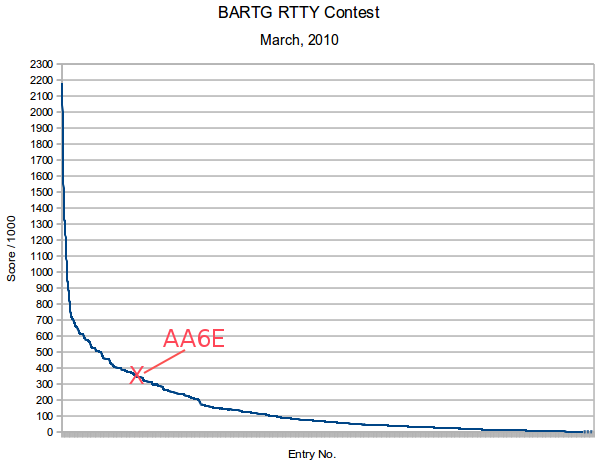 There is a small higher region, about 5.3 - 5.5 MHz also allocated to download. The increasing line attenuation with frequency is apparent. (At least, if you believe that "bitload" has something to do with signal power. I don't really know that.) The electrically measured line length from the Uverse node is 2554 feet, which puts me in the lowest of 3 service tiers. OK, second science test. The active DSL spectrum includes the 80 and 160 M ham bands. What's the interference potential? This is not a simple question. The interference from Uverse's DSL connection might not be much of a problem. Why? The received signal is going to be weak (indicated line attenuation is 21.6 dB.) The locally stronger transmitted signal, 3.7 - 5.0 MHz, is mostly outside the 80 M band, although there could be problems between 3.7 and 4.0 MHz, in the SSB band. Fortunately (? ), the 80 M band is naturally so noisy that the interference might not be noticeable.